what is a great publication on British Blues. Many thanks to Shakey Vic and Alan Vincent. 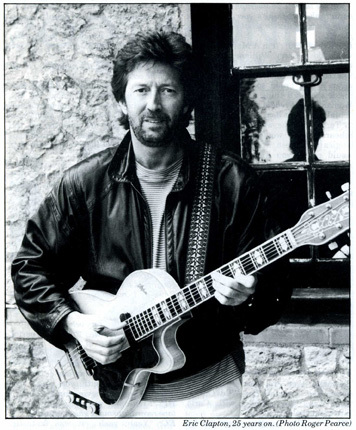 We start with a fascinating interview of Eric Clapton. "The interesting thing was that without really knowing about the regional aspects... was that I was always mainly attracted by people from the Delta -before I even knew they were from the Delta. There was something about the quality, that style, that set them apart for me, from any other region, you know, like anywhere in the South... even, you know, say Florida or you know,Mississippi... I mean Louisiana... or Texas... anywhere like that. But I didn't realise at the time, I just was drawn to the Mississippi Delta sound in whatever form it came - even when it got electric, when those people moved up to Chicago, it was still them that I wanted to hear. Yeah!" RP: "Hitching lifts, thumbing from Ripley to Kingston - vast distance..."
EC: "Yeah... and the guitar playing was just an incidental part of that whole routine, and it wasn'tlong, as you know, that I got a job doing it professionally, really... and though a lot of it was as I said before - bluff and front - I was very happy." PM: "During that period, did you try and sing?" EC: "Yes, I did, actually I think I did. I sang at home an awful lot, my grandmother will tell you this, it would drive her mad, I'd stay up all night, singing at the top of the stairs, I don't know why..."
EC: "Because it echoed. In fact, that's right, yeah! Dead right - it got a great sound." RP: "I used to do the same thing at home..."
EC: "Yeah, in the stairwell, but I would bottle up in public even if it were just a pub." RP: "But I can remember you singing in Kingston..."
RP: "Sort of outside the Crown pub. We all used to sit outside on the grass by the church and you'd sing for everyone." EC: "I think I used to sing 'San Francisco Bay Blues',when Jesse Fuller became flavour-of-the-month. Yeah." RP: "I can remember you teaching me the chords to 'Down and Out' the Bessie Smith song, on a train coming back from Wittering..."
RP: "Yes, but you were definitely singing. To me, you weren't afraid of singing in public - you were entertaining us! Everyone used to sit and listen." EC: "Oh well that's interesting, because I don't have that recollection - I remember it as being completely different - but maybe you've got a more objective point of view. I think what it was... I ran into Dave Brock (later to join Hawkwind). When I ran into Dave Brock he was such an outward, gregarious person he would always take the front and I would back off, you know?" RP: "So the first guitars you got, presumably these led to your first band, The Roosters? Would you like to cover that point?" EC: "Yeah, well I tried playing with the acoustic and I don't think I got very far with that, except when I bought this little 'George Washburn' for the amazing price of two quid in a market in Kingston. It had a picture - a drawing of Brigitte Bardot glued on the back of the guitar and I had to peel that off and everything, but then I went through the whole thing of playing in the pubs and everything. "I can't remember what it was... I think it was probably Muddy - listening to Muddy and the 'Best of Muddy Waters' album that prompted me to get the electric guitar... and also that 'Jimmy Reed At Carnegie Hall' album - that really had a profound effect on everyone that heard it, I think. "And... having conned my grandma into getting my first acoustic, I persuaded her to buy me that Kay which you inherited and it wasn't long after that really that I think first of all I did a little show in Richmond, with just me and someone else. I can't remember who the drummer was now. "I'd by this time met the 'Stones' and was watching them play so they gave me a lot of feeling that it was worth doing in the end." RP: " You were never afraid to go up to speak to someone like musicians - seeking advice… never intimidated?" EC: "Oh no, I was quite confident about what I was doing." RP: " Yes, I always remember you talking to other people... being quite gregarious amongst other musicians. Okay then: your practice methods... can you enlighten us on how you practised ?" EC: "Well in those days I think I practised with records -I listened constantly to records - and was absolutely devoted, and would just try by my ear alone.., not only techniques, but sound as well.., to use whatever technique was involved, like fingers or pick or whatever it seemed to sound like.., just to match it, you know? "But outside of that, I never practised, because I was frightened that I might learn the wrong things - I might learn to play in another style, or pick up something that I didn't want, you know? So I stuck very closely to being as simple as I could and just copy my idols, and never stepping off that path." RP: "So would it have been Chuck Berry or someone?" EC: "It was Chuck Berry and Jimmy Reed really… those two and a bit of Bo Diddley... and then later, Freddie King. RP: "He was very much more a vocalist than a guitar player..."
EC: "Well I disagree in a way, because you're right - yeah he was an accompanist to himself - but what he did on the guitar, with the slide and just the little chord shapes he would make, is so simple that it evades most players. "I mean, I don't know anyone that can actually play those figures... 'I Can't Be Satisfied'... I mean, I've heard Johnny Winter do it... and he overdoes it... it's so hard not to overdo it... and he overdoes it... everyone plays it too much. "So I kind of bypassed that, because, being a bit ambitious, I wanted to play more and that's how I got into the Freddie King thing... He was the first personI could actually see was going somewhere, outside of just playing accompaniment. He was playing lead, you know, and so that really attracted me." RP: "Then later it would be B.B.King or Otis Rush?" EC: "Yeah... B.B. King was much later for me because I thought he was too commercial to begin with. I bought an album by him that had... you know... saxes on it, and that was... ooh dear..."
RP: "Getting into the realms of show business." EC: "Yeah it was - then, anyway - it wasn't basic enough." RP: "Yes - he would 'appear' - rather than 'play'- somewhere." PM: "Wasn't downhome, was he?" EC: "Not at all... No!" RP: "We'd like to ask you about your first band." EC: "Well... 'The Roosters' was the first band." RP: "Was that with Tom McGuiness?" EC: "Tom McGuiness and Ben Palmer and Terry... oh I can't remember...oh God what was his last name? Brennan - he was the singer... and a drummer...And the drummer's Mum owned the car that we travelled in... so the whole band hinged on that, really... that's how we got to gigs. There was this convertible Morris Minor that we packed everything into - it was just doomed from the word go... 'cos we didn't have the funds, and we were far too dedicated, real purists... and Ben especially was very self-critical.., and critical of the band, too. "And it was too passionate to last long, you know, and when it did fold , Tom McGuiness and I got a job in 'Casey Jones'. I mean, you make your bones in all these things - I learnt a lot about touring, even on a small scale with those bands." RP: "Were you still with Ben in 'Casey Jones'?" EC: "No, Ben had retired at that point, completely, and become a woodcarver full time - which I think he still is… But it was a great little band to begin with, because the enthusiasm, the dedication, was all there"
RP: "This would be the 'Roosters'?" RP: "All the things I've read about that period… the Roosters are never discussed - you see the one photograph and a brief paragraph - nothing's ever said about what the band did, or what numbers you played. EC: "Oh we did... 'I'm A Man'... then we would do a Larry Williams song, you know, like 'Slowdown' or... something like that, and then a Bo Diddley... I mean a real broad spectrum of music inside the R&B thing and... 'I Loved A Woman'... a Freddie King song... and actually, a great deal of credit has to go to Terry - for he would bring to each rehearsal... he would bring his new singles and these were the things we would cover, you know, and he was really quite a purist. "And we would try to get as dedicated as we could and it was much more of a blues band than anything I played in afterwards until John Mayall." PM: "Can you remember some of the venues you played at?" EC: "Phew, crumbs! I just remember the rehearsals being above a pub in Kingston. I think we played 'The Cellar'... maybe a couple of seaside places, but it was so, so chaotic and amateurish... I don't know how we got it together at all, really. I had the 'Kay' then and I had..."
EC: "But even then, we had our heroes. The band, then, we were all trying to sound like.., was it The Wild Ones... what were they called.., with Carlo Little and Nicky Hopkins?" RP: "Oh... The Savages - Lord Sutch's band." RP: "Really 'savage' stuff. Do you want to discuss the Yardbirds, or do you want to leave that out?" EC: "No… let's talk about it all… whatever you want." RP: "Really I mean, what I remember of you in the Yardbirds when you joined, the first few months were really happy times. I used to travel about with you all in the van and watch all the looning around, the playing about." RP: "And then it all changed.. it all became serious." EC: "Yeah, it did, didn't it? I think that recording did that, you know. It's like the first time you look in the mirror and you've had all this illusion about how good looking you are, and you get the horrible truth and that was what happened... I think when we first did that live album, did it to me. "It was just like.., oh dear, it was quite a shock that we were so kind of rough, but everyone loved it, and that was confusing for me." RP: "I still love it... it takes you back to those days." EC: "Yeah, so do I now, inretrospect, yeah but I think that was when we started taking it seriously, which is what you do when you start to become self-conscious." RP: "I remember those first weeks, when you joined the band, were very very happy times - I remember them with great affection." RP: "You seemed very very contented." EC: "Well, there was that great period with the flat..."
EC: "Yeah, that was fantasic... well I remember that as being one of the best periods of my youth you know 'cos everyone was just having fun." RP: "I remember you all used to rig up a tape recorder to make ghost noises!" EC: "Yeah, yeah... it was fantastic, sharing that bedroom with Dreja... hilarious! Hilarious times! But it was the recordings, I think, that made us start to evaluate everything and try to be serious - much too early on - we just lost our carelessness." RP: "I can remember Keith Relf sort of becoming very professional - almost overnight. When it first started, it was all a laugh... then suddenly he became very serious - almost unapproachable at times.., always worried, that's when for me, the fun stopped." EC: "I remember Samwell Smith had that problem. I think that he - no... I've always blamed him for everything, poor guy - but he was the studious, serious one, you know." RP: "So... I think that's as far as we can go, really, because I didn't want to cover the later years with The Yardbirds, Mayall or Cream, because it's all been so well documented before... what we really wanted were your formative years." It was at this point that we broke for lunch in the pub at the top of Eric's drive. Over drinks and sandwiches, we discussed old times... and the present... and Eric recounted some hair-raising stories about Chuck Berry. These, and other tales of Muddy Waters, Howling Wolf and Buddy Guy, will have to wait until the next issue.